Station to Station, David Bowie’s 1976 album, could be considered the bridge between his previous Young Americans’ soul boy phase and the great set of records he would make forming the Berlin trilogy. Its six songs are an ambitious mixture of taut funk and avant-garde rock: the foreboding 10-minute plus title song combines theatrical art rock with disco; “Golden Years,” a classic Bowie song, could have certainly been on Young Americans for its urban, R&B sheen; “Word on a Wing” is a lovely, romantic heartfelt ballad; the swinging “TVC15” is futuristic pop; the hard rocking “Stay” is a furious cut that could have been the soundtrack to any ‘70s gritty exploitation movie; and the finale, a rendition of “Wild is the Wing” is a devastatingly haunting and doomy ballad. A great band of sidemen accompanies Bowie on this record, among them guitarists Carlos Alomar and Earl Slick. 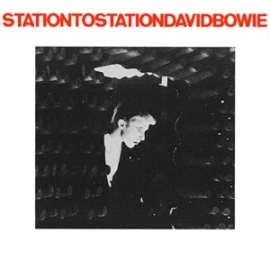 It’s not far off to say that of all the albums in the Bowie catalog, Station to Station is the ultimate greatest. This deluxe reissue also contains finally the 1976 Nassau Coliseum concert (the closest to one getting a glimpse of Bowie live during that period was two live tracks that were on the 1990 Rykodisc reissue). The performances that night were smoking, especially on Stay, where the guitar work is absolutely splendid; in addition to performing the then-new album songs, the Thin White Duke also delivered on a cover of the Velvet Underground’s “Waiting for the Man” along with a funk rock take of “Panic in Detroit” and a disco-fied “Changes.” A great album just got even better now with this belatedly officially released concert document.